I stumbled across Jenn Cuisine’s call for help. She asked that food bloggers donate their posts today to promote donating to the victims of Hurricane Sandy. Thanks for pioneering this day, Jenn! I have quite a few friends and a cousin in NYC and the surrounding area. Many who lost power and one who lost everything. As if this storm wasn’t enough, there’s another winter storm rolling through with freezing temperatures. I just pray that those who need help and food get it. As a Florida resident, hurricanes are all too familiar to me. It makes me grateful for all that I have knowing the next storm could hit here. I decided to post about one of my favorite comfort foods. My mom’s chili was always one of those foods that gave me the warm fuzzies on a cold day. 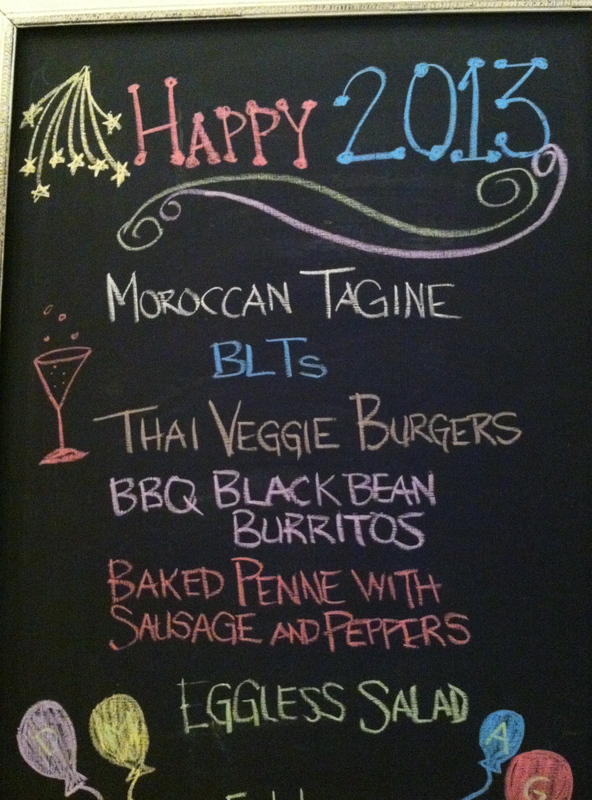 Now that our home is meatless and dairy free, I’ve revised the recipe a bit. And dare I say that it really tastes no different to me. 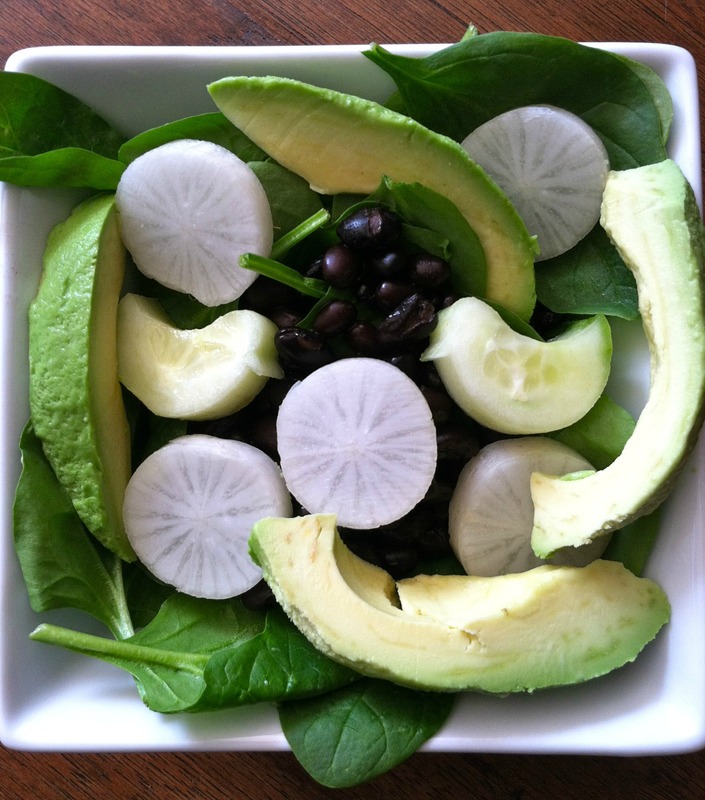 This recipe is gluten free, meatless and dairy free. It could also be soy free if you leave out the soy crumbles and add extra beans. 1 large onion, chopped. I rarely use oil in my cooking so I start with about 1/4 cup of water with the onions and add as necessary to prevent sticking. I mash about half the beans which helps to thicken the chili. Heat over medium heat for about 1 hour. Take the bay leaf out before serving. 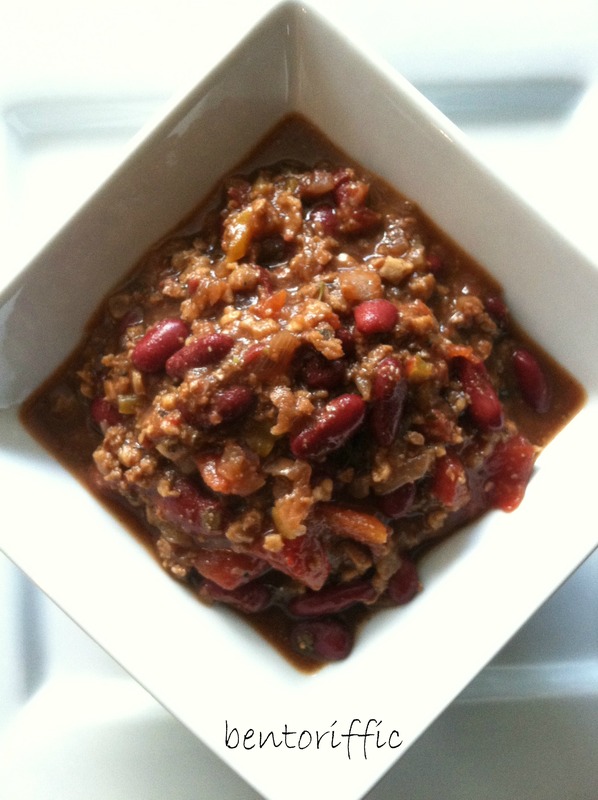 This chili usually taste better the longer it sits, even the next day. We often top it with a dollop of Tofutti brand dairy free sour cream and some Daiya brand non-dairy cheese shreds. Serve with crackers or cornbread. 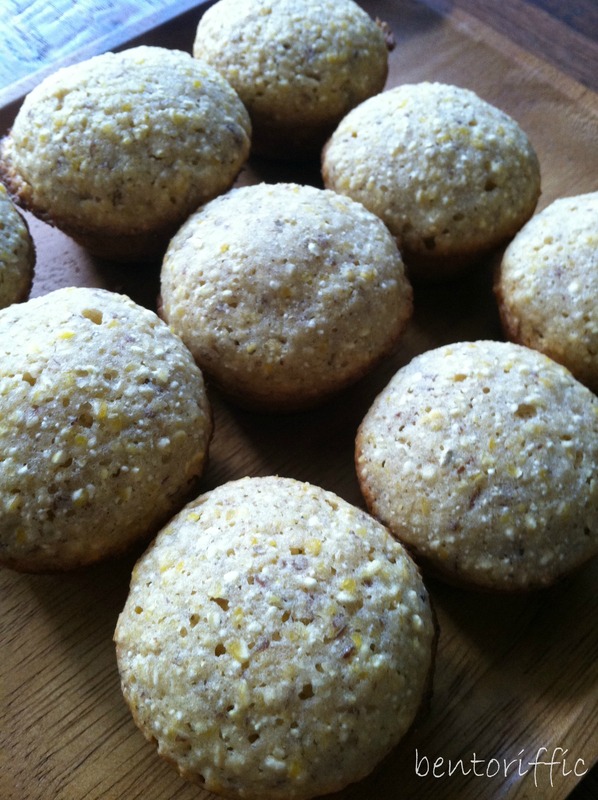 I made vegan cornbread mini muffins to go with our chili. 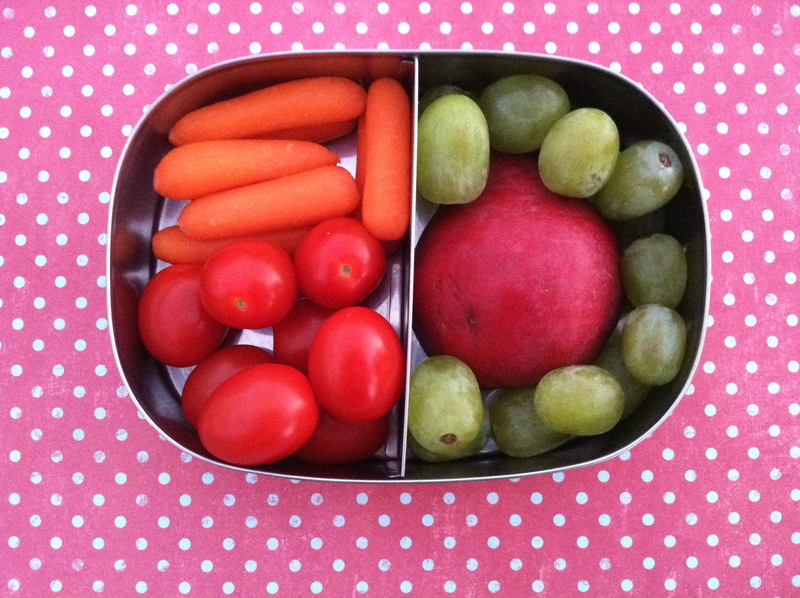 In a rush for fun lunches? My go to is always the stash of cookie cutters. 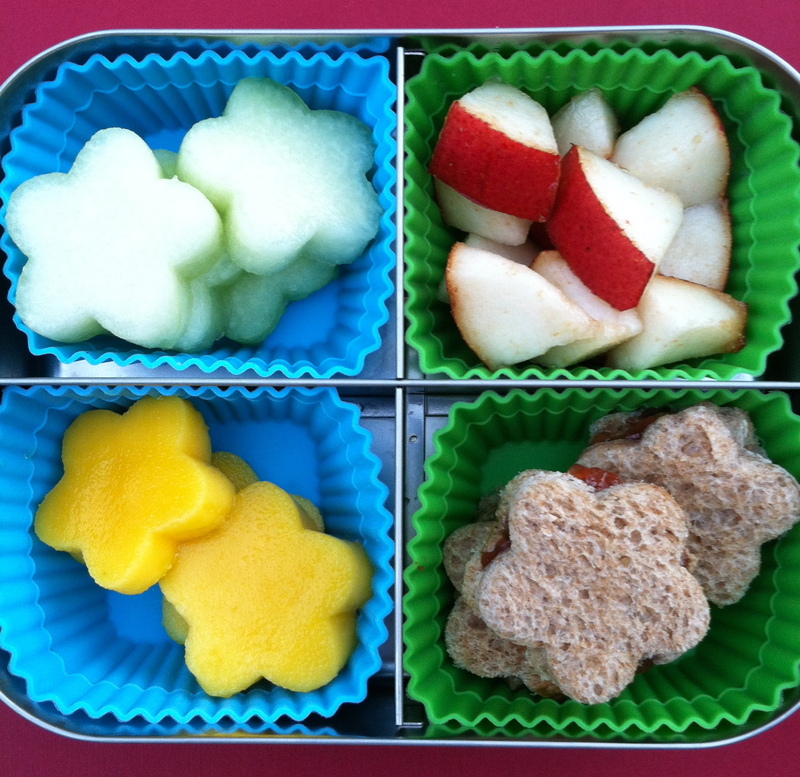 These sandwiches are made from linzer cookie cutters which have interchangeable shapes in the middle. As far as children go, they aren’t any different than adults. They like their food to be pleasing to the eyes. 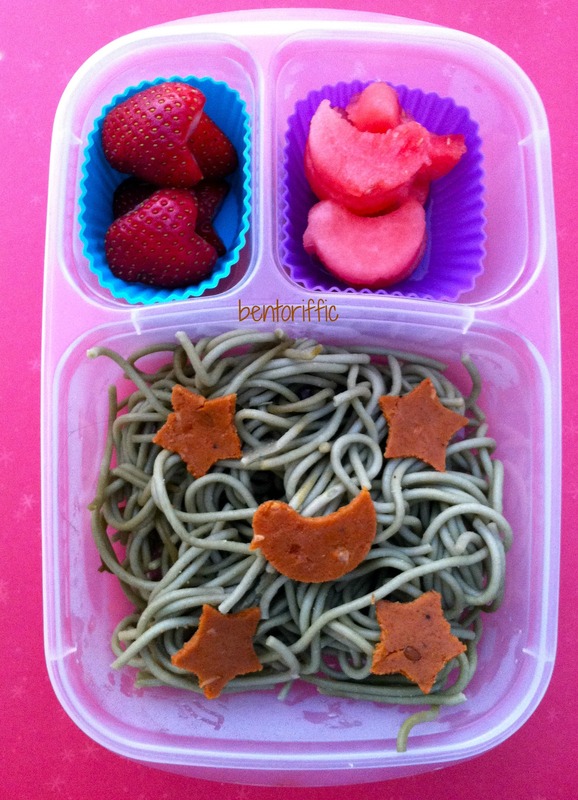 If it looks fun and colorful, they are more likely to try it and eat it! 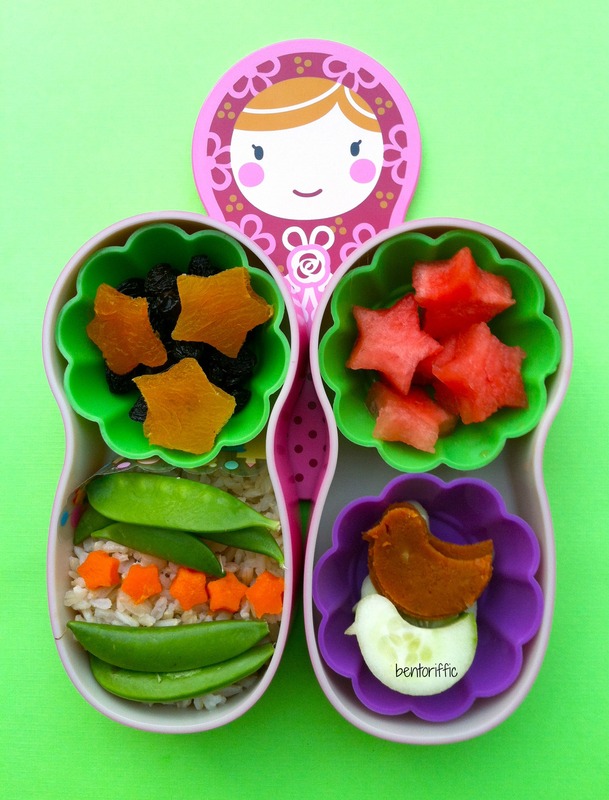 Above is my 4 year old daughter’s lunch. 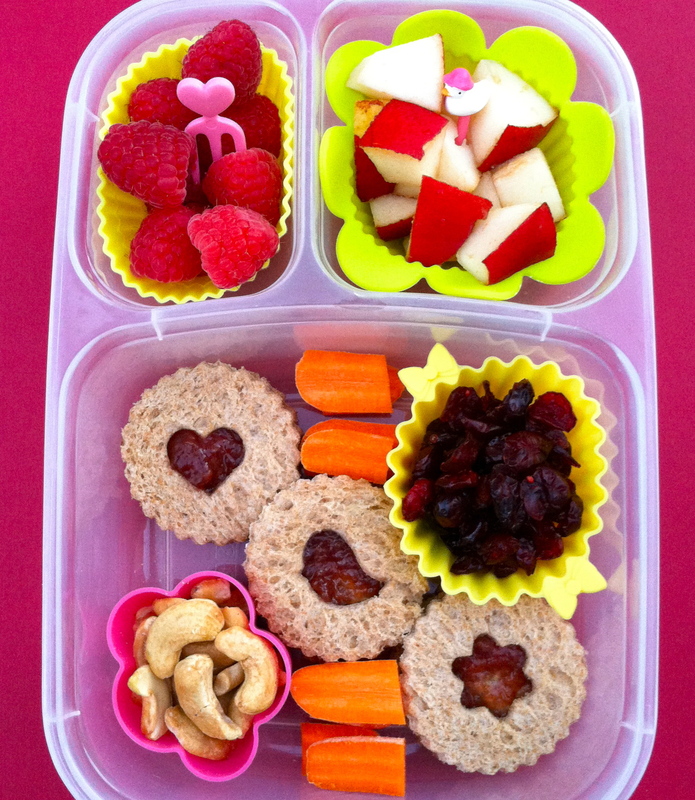 The Rudi’s brand whole grain bread sandwiches are filled with almond butter & strawberry jam. The cut out shapes came with my linzer cookie cutters. 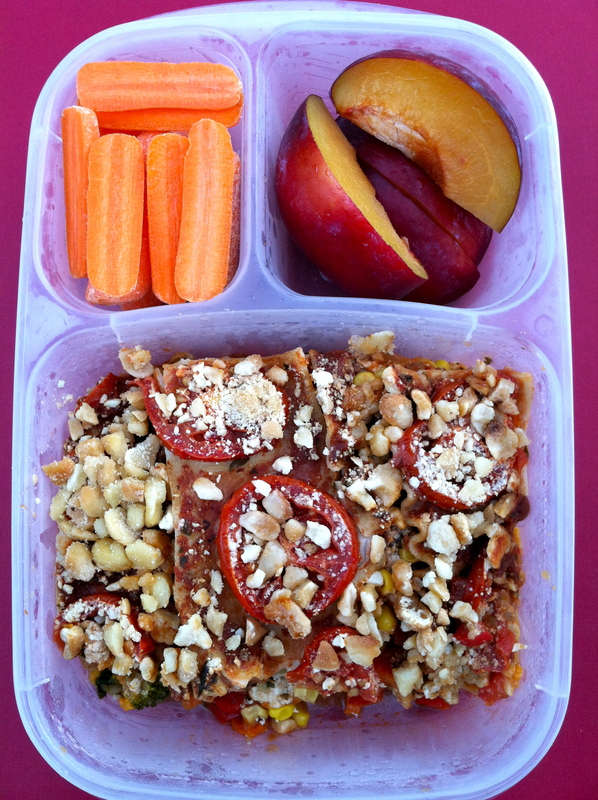 Near the sandwiches are mini carrot pieces, cashews and dried cranberries. 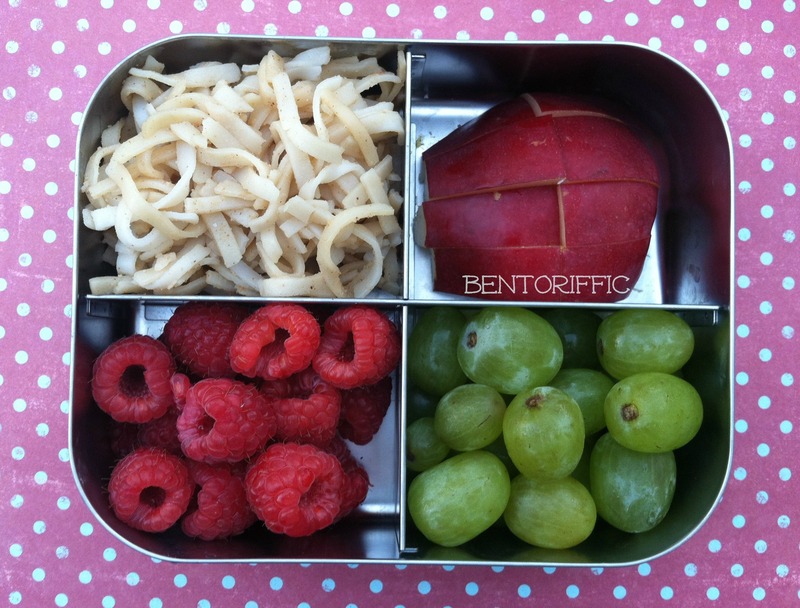 At the top left are raspberries and the top right are d’anjou pear pieces packed in her Easy Lunchboxes container. 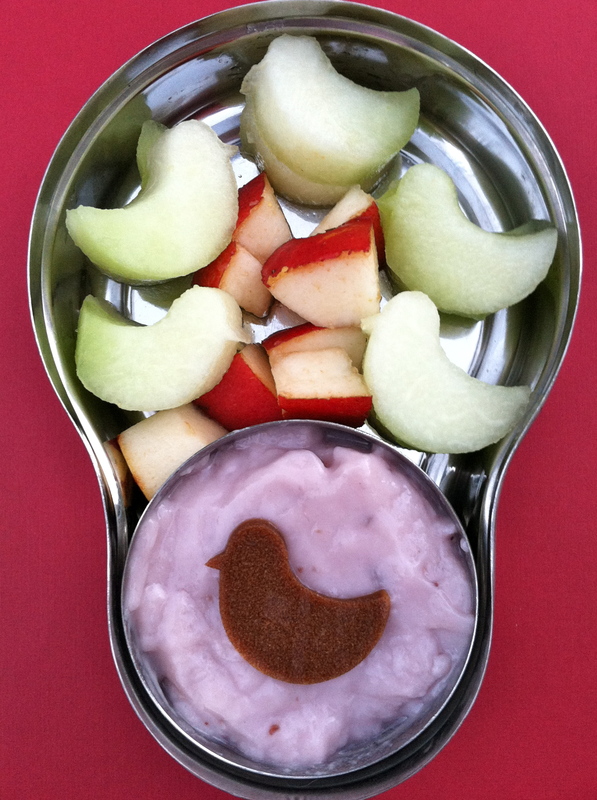 Miss G’s afternoon snack packed in her Happy Tiffin brand stainless container is Amande brand almond milk yogurt in the bottom with a Stretch Island fruit leather bird. Above are more d’anjou pear pieces. The birds on the outside look like honeydew melon. 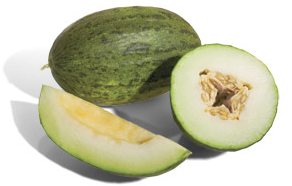 I actually found a new melon at the local organic market this weekend called Piel De Sapo. It looks like the shape of a honeydew with the skin of a watermelon. It is a bit sweeter than honeydew & delicious! I may go back & buy another one before they’re gone. My 2 year old likes to have everything bite sized otherwise it ends up being picked over and left. 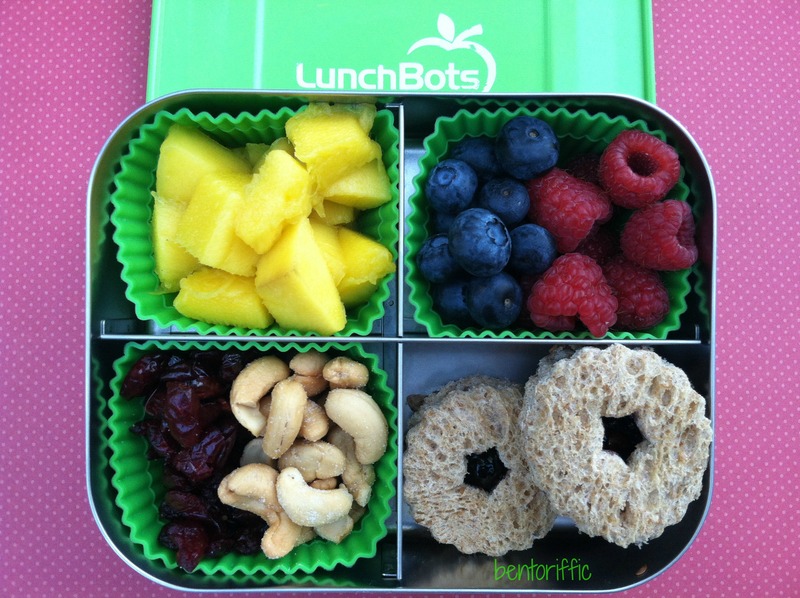 This morsel-sized lunch is packed in her LunchBots Quad stainless container. 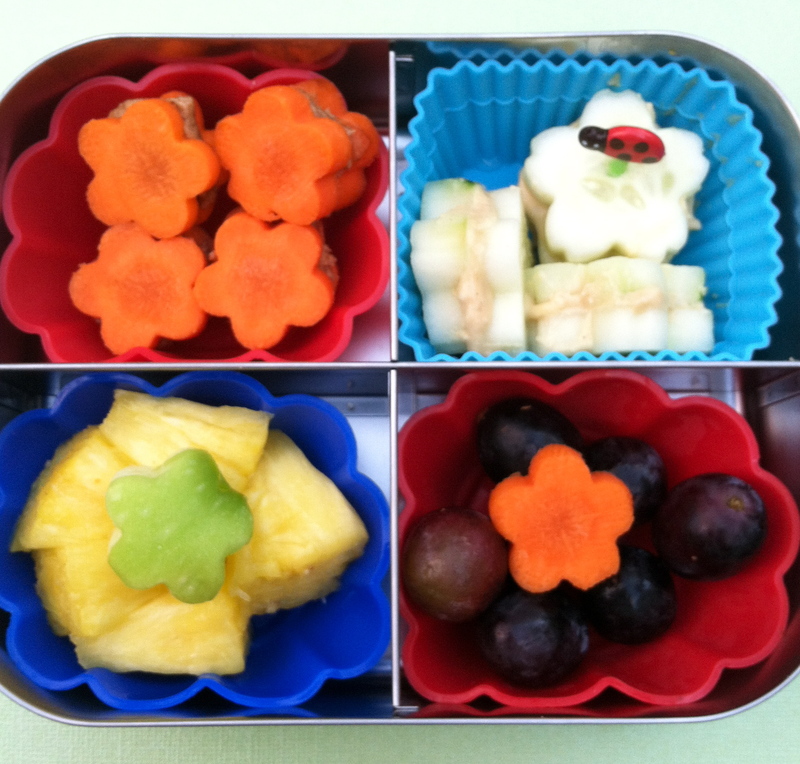 Clockwise from the top left are piel de sapo melon flowers, d’anjou pear pieces, flower sandwiches are Rudi’s whole grain with almond butter & jam, and mango flowers. 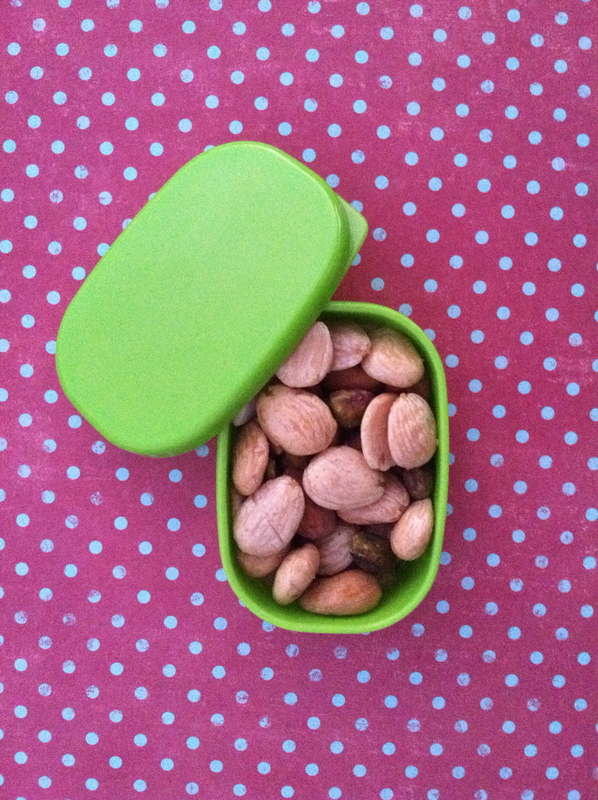 My favorite part of packing lunches every day is knowing that there is no waste. 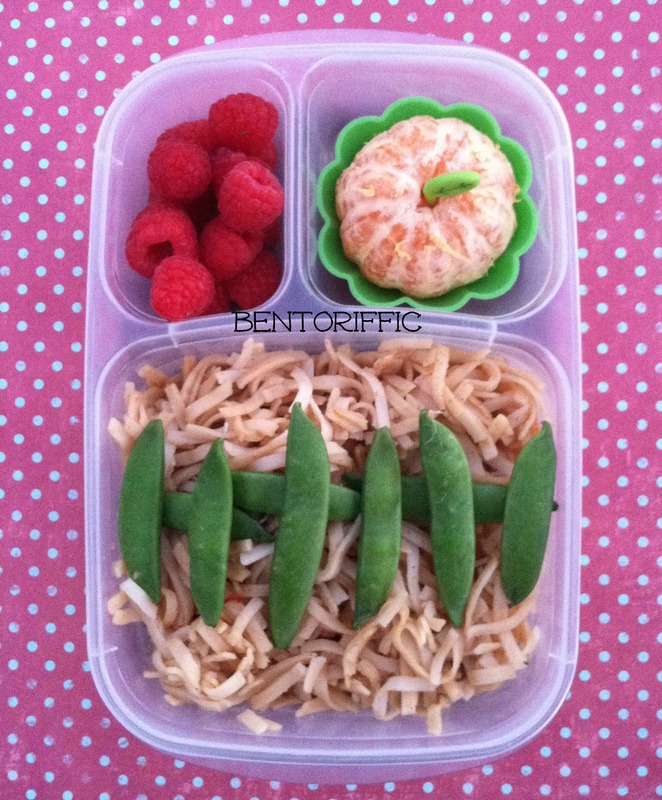 No disposable plastic bags as the silicone cups and Easy Lunchboxes compartments do the work for me. I send the girls and my husband with cloth napkins and reusable napkins each day, and they all take their water bottles which can be refilled thoughout the day. My husband has leftover dinner from last night. 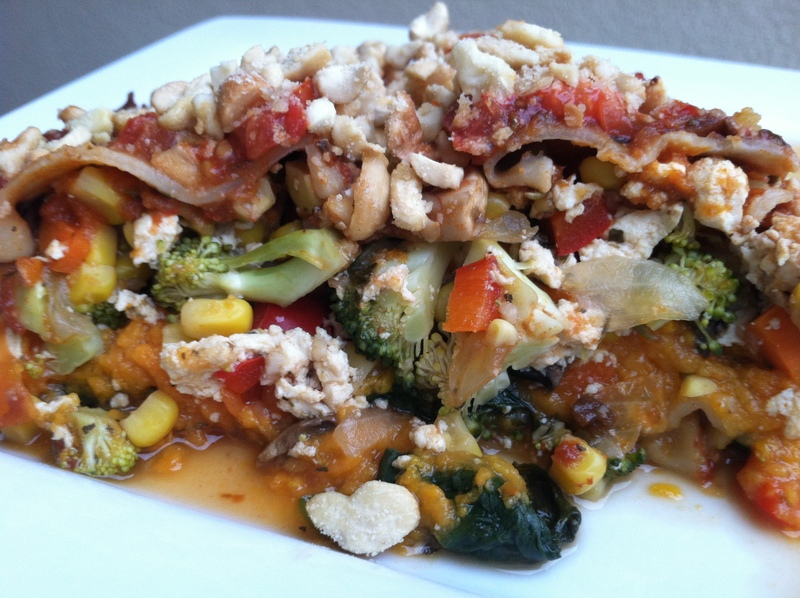 I made the Engine 2 Diet’s plant based Sweet Potato Lasagna. I think it looked prettier on the plate last night. 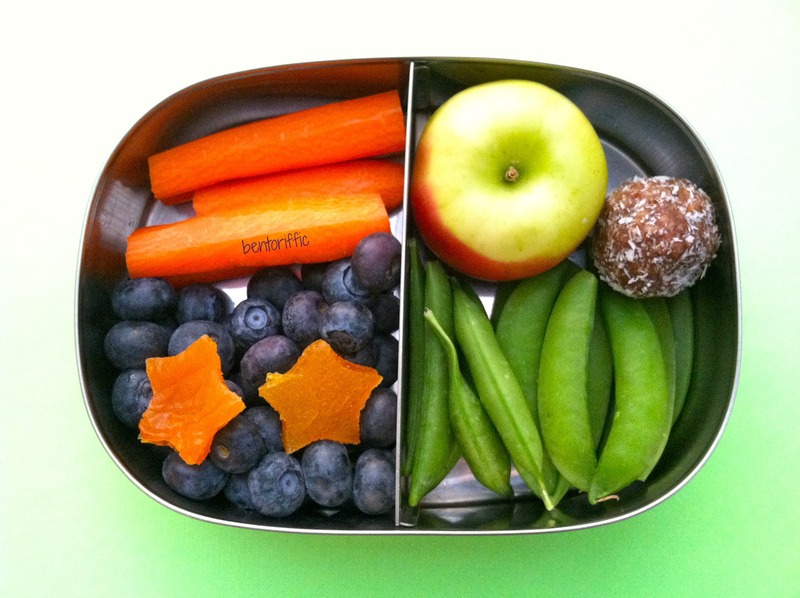 And below are the leftovers with nectarines and carrot sticks packed to go for lunch at the office.